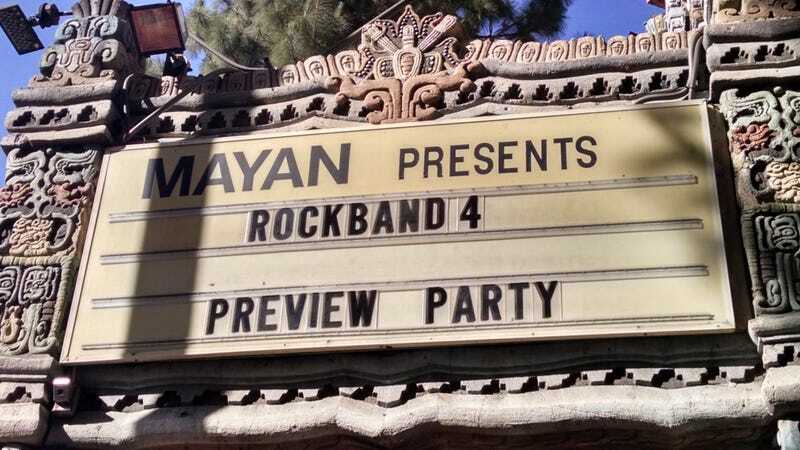 RockBand 4 Preview Party Post! It’s not everyday that you get a chance to go hands on with a game months before release. This past Tuesday I did exactly that thanks to Harmonix and Mad Catz throwing a public event for the upcoming Rockband 4. RB4 looks and plays pretty much how you’d expect. If you weren’t keen on the series before you may not exactly be clamoring to play this new iteration. For the uninitiated, Rockband allows you to live out your rock and roll fantasies by matching guitar/bass strums, drum hits, and vocals to your favorite songs from yesterday and today. The features in this game are plentiful and helpful if you wanna keep the party going. Voting for a song after your chosen setlist removes the tedium of scrolling through song lists. Because Rockband 4 believes in democracy majority vote will choose the next song. There’s a lot going on here and I had a hard time getting a hang of it. Thankfully this is an optional feature. I want to play the actual solo to My God Is The Sun thank you very much! Minor gripes aside, the game is still tons of fun. The event itself was packed and the line to get on the mainstage was quite long which I was not expecting. Giving nerds a couple drink tickets removes all stage fright apparently. Its super effective! There were 2 other kiosks showing off the guitar solo feature. The line for these was shorter but because this is all a work in progress the unit kept malfunctioning. Took over an hour before I got to strum to my hearts content. Then after waiting in the big line for another hour the unit on stage also became unresponsive! Had I been cursed? Xbox One devkits take a while to bootup btw. I was up there for a while before we got to play Piece Of My Heart by Janis Joplin. As the shindig began to wind down the reps thanked everyone for attending and invited all those who were still in the building on stage to perform More Than A Feeling. How could I refuse? All in all this event was a success. Having the opportunity to try out the new songs, better instruments, and new functionality before the general public was a real treat. My band is impatiently waiting for October 6th when Rockband 4 releases.